The Queen of Soul was among a group of people recognised by the prestigious American university, along with former US president George HW Bush. 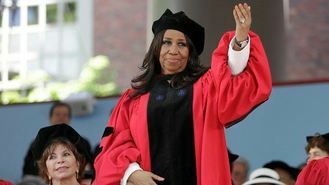 Singer Aretha, 72, was presented with an honorary doctor of arts degree. The star - whose legendary career spans more than five decades - accompanied herself on piano to perform the National Anthem at the ceremony. Former New York City Mayor Michael Bloomberg was also among the people who received an honorary degree. A song inspired by a series of First World War letters will get its first airing today as part of a project about life on the Home Front. Ed Sheeran appears to take a cheeky dig at an ex-girlfriend as he shot a new ad. James Arthur has insisted he no longer feels angry and resentful, as he bushed off being dropped by SyCo. A British folk band signed to a seven-figure recording contract are to release an album backed by a paltry £10 worth of musical instruments. Bon Jovi guitarist Richie Sambora has revealed he drew on his own past when he debuted a song at a forum on drug abuse. A video appearing to show two members of boy band One Direction smoking what they call a "joint" has emerged, as the group bring their world tour to England. Pharrell Williams says everyone should be able to celebrate joy - including Iranian youths who were arrested for posting an Internet video of them dancing to his song Happy.